The United Arab Emirates is known for its vast range of activities and experiences that capture the hearts of its residents, and even more, its visitors. So, if you have not already applied for your UAE visit visa, go ahead and do so, or else you will miss out on a lot. How to get UAE visa? All you need is a passport copy and a personal photo of a passport size and a white background. After that, just get someone you know who resides in the UAE to be your guarantor, and you are all set. You can apply for a 14 days UAE visa, but if you want to freely explore the country and all that it has to offer you better go for a 30 days UAE visa or a 90 days UAE visa. The Philippines nationals are on 3rd number constituting the population of the UAE. So we offer very affordable UAE visa for the Philippines. The Filipinos can avail the best round-trip flights from Dubai to Manila to Dubai according to their budget. Ice and Snow in the heart of the Middle East? That is right! You could literally go skiing inside the Mall of the Emirates, in Ski Dubai, and even meet some penguins. Also, you could go sip on some hot chocolate in Chill Out. Chill Out is a lounge with seats and tables and some of the surroundings made up entirely of ice. The beaches in Dubai are the perfect way to escape the heat in summer and enjoy the cool breeze in winter. The water is always clean and of a beautiful bluish color. The water activities to enjoy are too many to count. You could go jet skiing, kayaking, riding in donut-shaped boats, and much more. 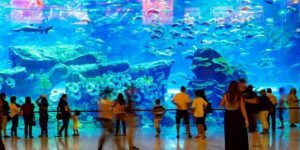 Another way to really experience the sea world is to swim with the marvelous sharks and other interesting sea creatures in the huge aquarium in the Dubai Mall. Try going all the way to the top of the Burj Khalifa and take a selfie with the entire city. Try out the ATM that dispenses gold bars – yes, they exist.